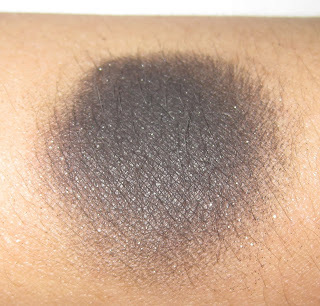 The latest product from Dystopia that I am going to show you is a new Powder Eye Shadow – with a twist. 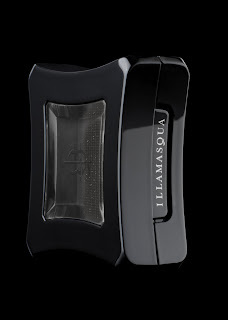 This product is a black Powder Eye Shadow with glitter in it – so technically this is a brand, spanking new texture from Illamasqua! ‘Machine’ has a very buildable base, meaning it can look dark grey when first applied or layered up for a true, intense black. The glitter means the colour catches the light beautifully – glitter does not have to mean an overdose of shimmer. I think it looks a lot more impactful because of the matt texture of the Eye Shadow. I have paired it here with the new Liquid Metal in ‘Phenomena’. I love to mix up textures and begun with a dewy base of Light Liquid Foundation topped off with a touch of Press Powder [this camera is so good that it tends to make my face look like an oil slick!] and pressed in a little Cream Blusher in ‘Seduce’. For the eyes, I used a base of Cream Eye Shadow in ‘Amorous’, a lovely grey/ aubergine that acts well as a base for heavy eye colour. I then smudged ‘Phenomena’ into the inner corner and across half of the lid and then built up ‘Machine’ around the outer corner and through the socket. These products blended really easily together and I really liked the finish look. I went to the gym this morning and left my make-up kit at home [not really a problem when you work at Illamasqua, but annoying all the same!] and have been mascara-less all day. I think this look actually looks great without mascara as it keeps the focus on the texture of the shadows with no long black lashes in the way!